The telephone rested on a small platform with a seat and having 4 small plastic swivel castors so that William’s mother, - it never seemed to be his dad, - could move it to clean the carpet. He picked up the phone and rang first Sharon, the youngest, and most likely to be at home. Only Elizabeth, who went to a private school in Rotville, had not arrived home and William efficiently arranged for them to meet after their evening meals, at the shed on the allotment of Shane’s father. A message was left for Elizabeth. At 7pm they all arrived at the shed, now dressed in holiday clothes and free of their school uniforms. Bobby arrived last, pulling Tonka along, loaded with a medium sized lidded box. In this box were the tools of the Goolee gang – scissors, string, hammer, screwdriver and various other items. On the relatively short journey, Tonka had thought that standing all day on his wheels had been bad enough, but now every excursion however small, caused him untold grief and pain! He not only ached every time he was pulled over a pothole, but he was being deafened as well. Down to business then. They had to plan the next 6 weeks around various tasks and jobs that they were required to do daily for pocket-money. The sun was still high and as they idyllically contemplated the coming weeks, the farmer on his tractor was carrying out tasks in the adjoining field. 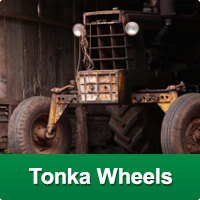 If only they could get some very large solid rubber tyred wheels for Tonka like these on the tractor – what a joy! It didn’t, at that point, occur to them that if they ever had such large wheels on Tonka they would never be able to scale the height to get on board!